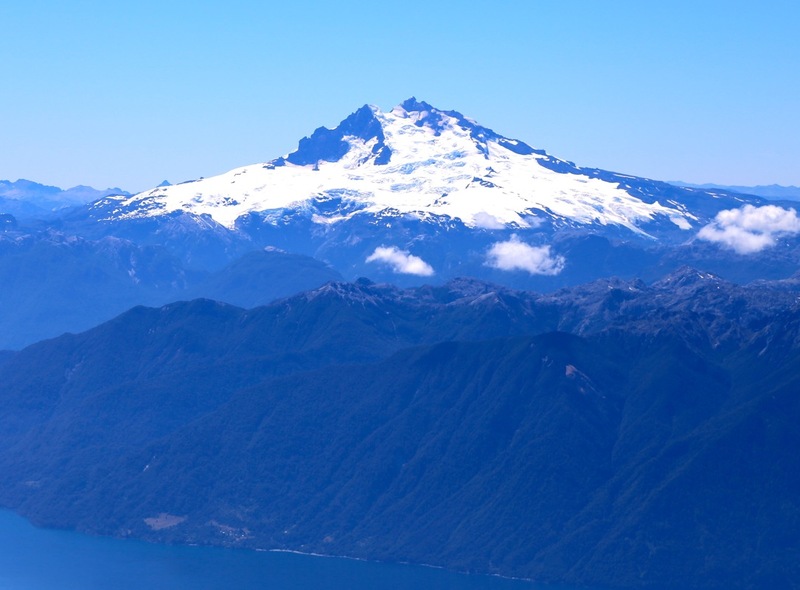 The mountain is right next to, and east of the big Lago Llanquihue. 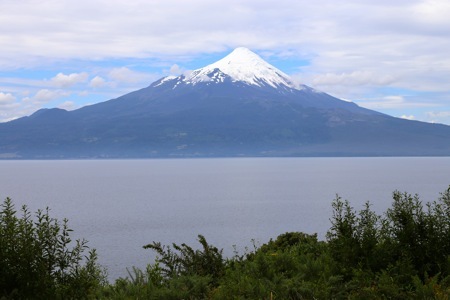 From the tourist town of Puerto Varas, drive about 50 kilometer northeast (Chile 225) along the lake to Ensenada. 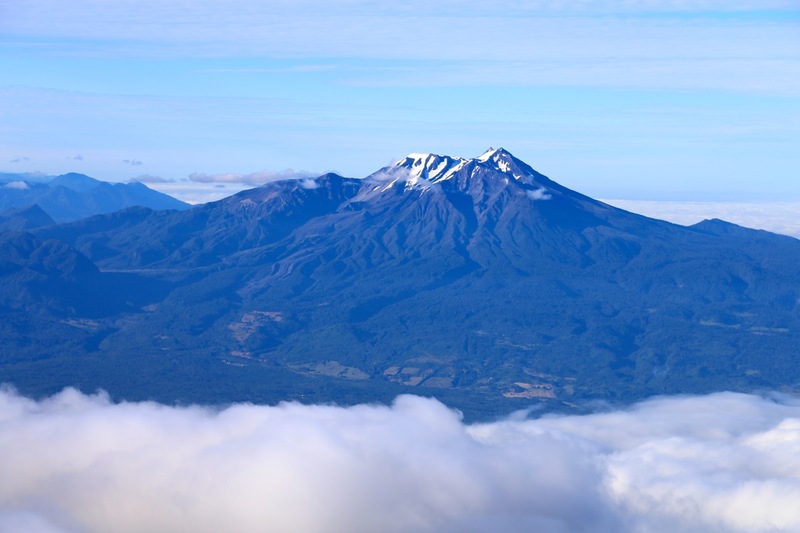 In Ensenada, fork left, then shortly turn right onto the road that serves Volcan Osorno and its ski area. This road is well signed. Continue steeply uphill on a good, paved road until it ends. The parking is right below a cafeteria at location S41.12808, W072.52927, elevation about 1200 meter. 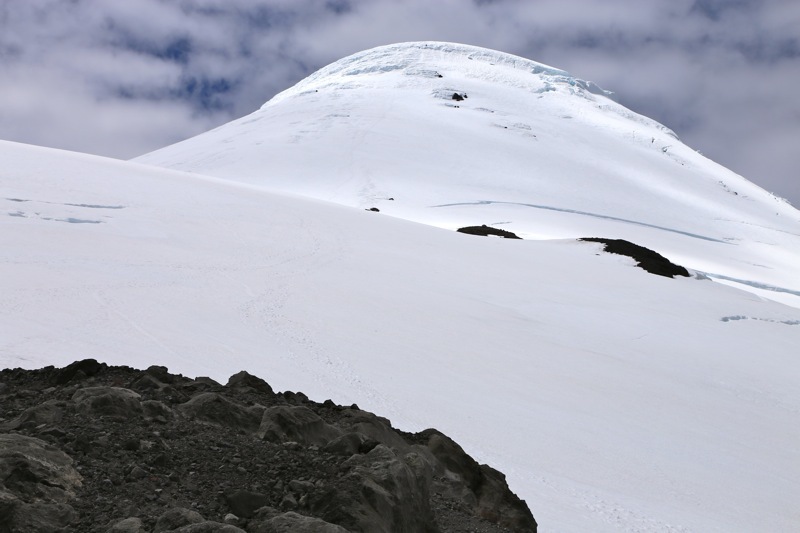 Almost all parties climbing Osorno does this with a local guide, however, one may do this independently with a permit from the local Conaf office. Thus, one should register your climb with the local Conaf office. This is located below (left when facing the mountain) the main parking area. 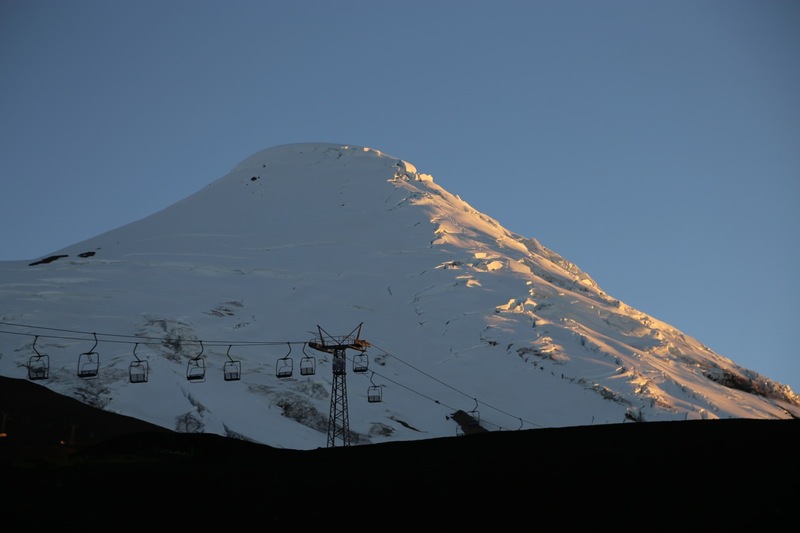 One can drive directly to the office by turning left on the road signed for Refuguio Teski, immediately before the main ski area. The office is located on the left hand side of this road beyond the refugio. A paper form must be filled out (including your blood type! 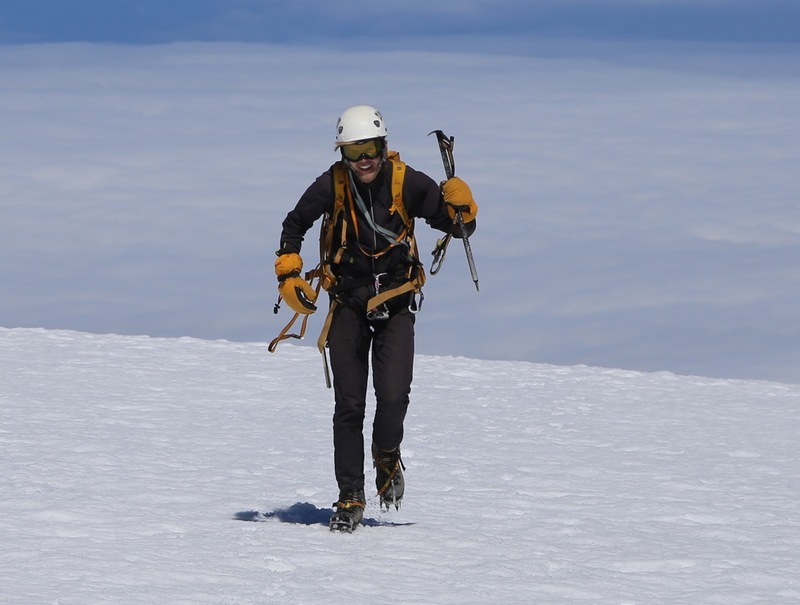 ), however, the main criteria still seems to be that you can show that you have adequate equipment for the climb. 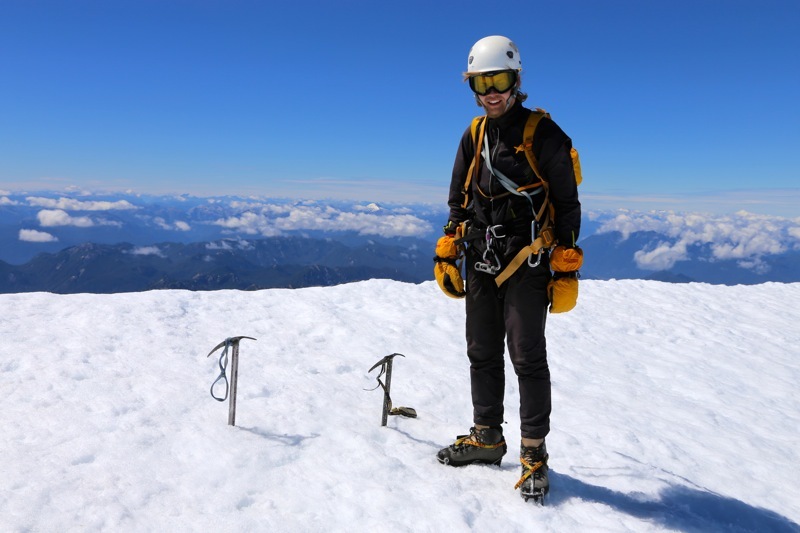 The most essential items being a climbing rope, crampons, ice axe(s), ice screws and snow anchors / snow stakes. A clear path continues uphill, skirting the top lift on its left. From here, the path continues up along a moraine ridge that should be followed all the way to its end (top). The path is pretty good despite the common volcanic, loose material. the top of the moraine is about 2060 meter at location S41.10710, W072.51092. From the top of the moraine, the rest of the route is pretty clear. Ascend more or less straight uphill on this face directly to the top. There are some rocks extending from the glacier to your right. The first part is up on a gentle slope. 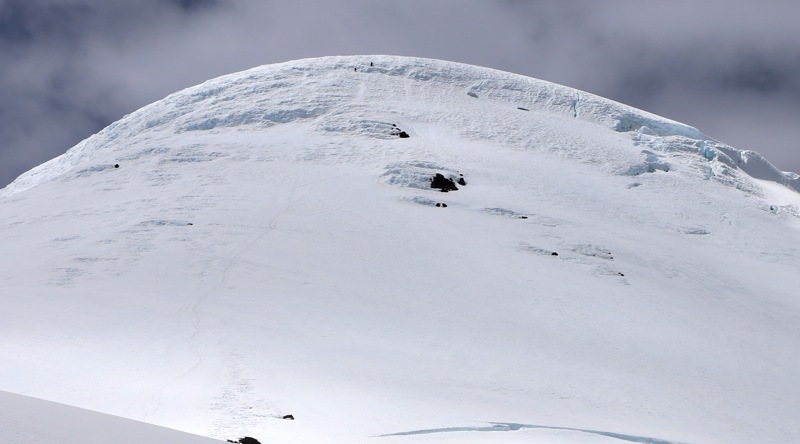 This slope steepens considerably (about 25-30 degrees) in the middle section. Finally, there is the upper, steep part. This can be climbed in two pitches with a 60 meter rope. The exact route may change a bit from year to year, there are some seracs and often a short, final wall that must be negotiated. 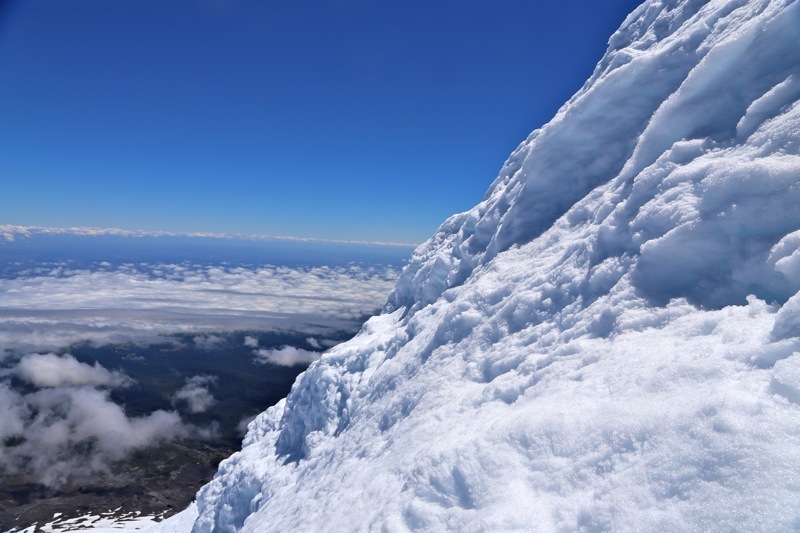 The last pitch is steep snow/ice up to 55 degrees. Above the final "wall", the terrain immediately turns into a very gentle slope that continues to the very top. The highest point is immediately on the edge of the very steep (north) slope. Care should be exercised here as there could be a cornice or unstable snow at the very edge, stop (at least) one meter from the sharp edge. Note that the conditions and the level of difficulty of this route may change quite a bit, depending on the local conditions. 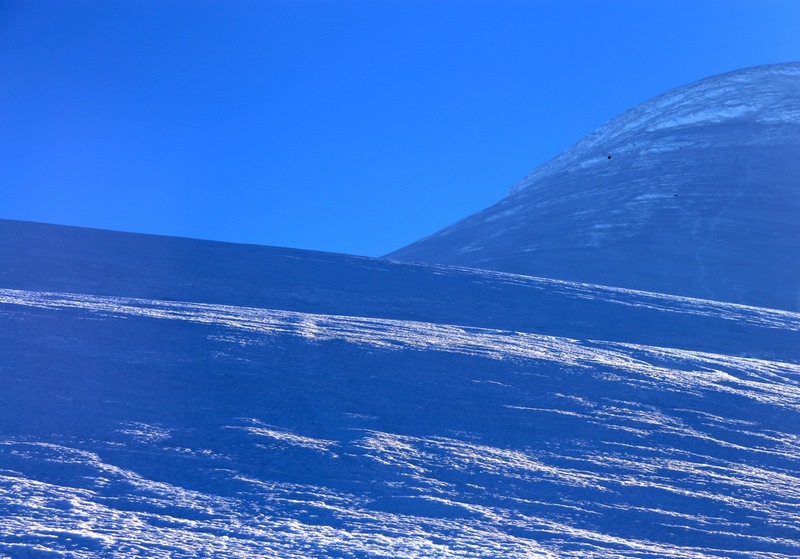 It is likely easier in the early season when the guided parties will establish a track in the snow. As the summer progresses, the snow typically turns more and more icy. 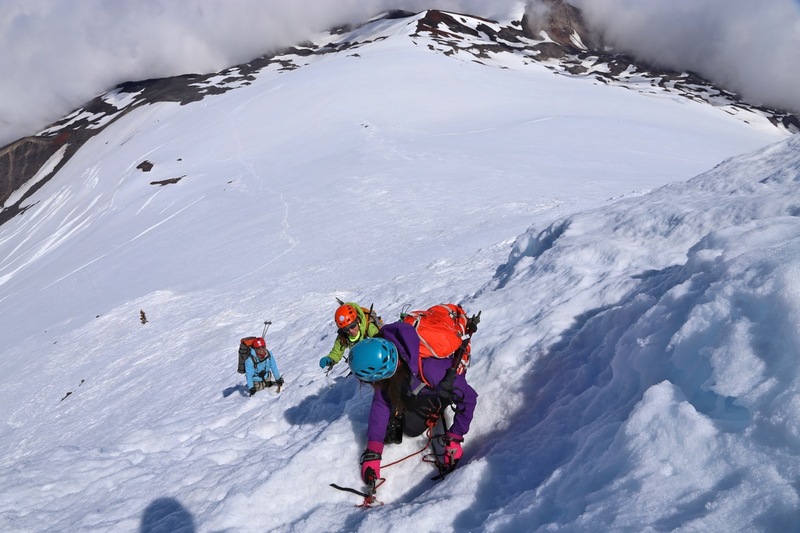 When we were there, one could not see any specific track, but a fairly natural route, more or less directly up the slope, seemed to be the choice of all (4) parties on the mountain that day. We got up around 0515 and departed from our "base" in Puente Varas shortly thereafter. No other cars in the parking lot when we arrived at the ski area shortly before 0700. We started uphill at 0700, following the track under the lower skilift. 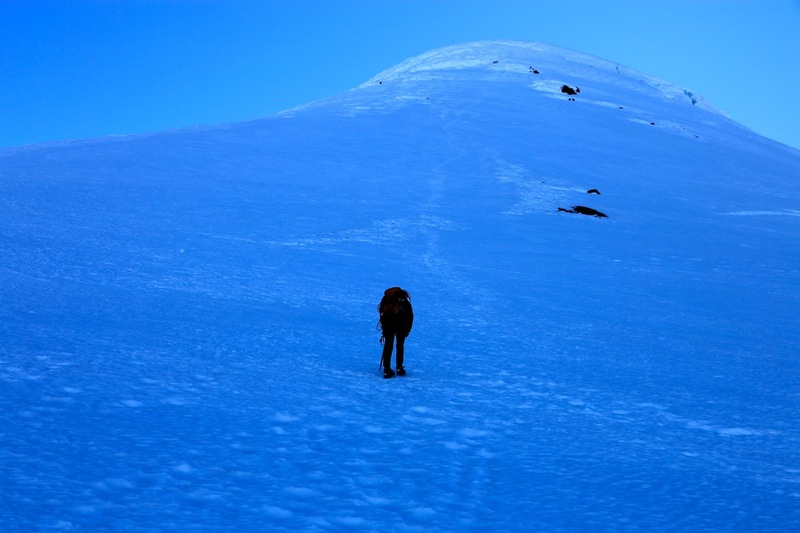 Soon, the footprints turned more left, but as we got higher the route became unclear. We traversed a bit right on loose ground, then headed uphill on what looked like a local hill. On top, we discovered two parked SUVs. It became clear that a drivable road existed left of our ascent route. The remaining trail to the top of the moraine was clear and we overtook 2 guided teams on our way up. We made a short break at the top of the moraine, a carpet of clouds was below us and the view was already quite outstanding. 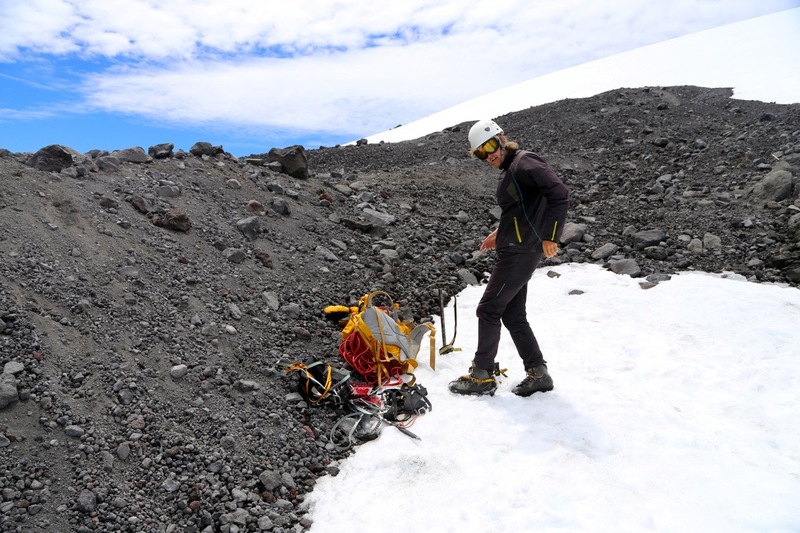 We could see one team already high on the steeper part of the volcano, as we stepped onto the icy glacier shortly after 0900. 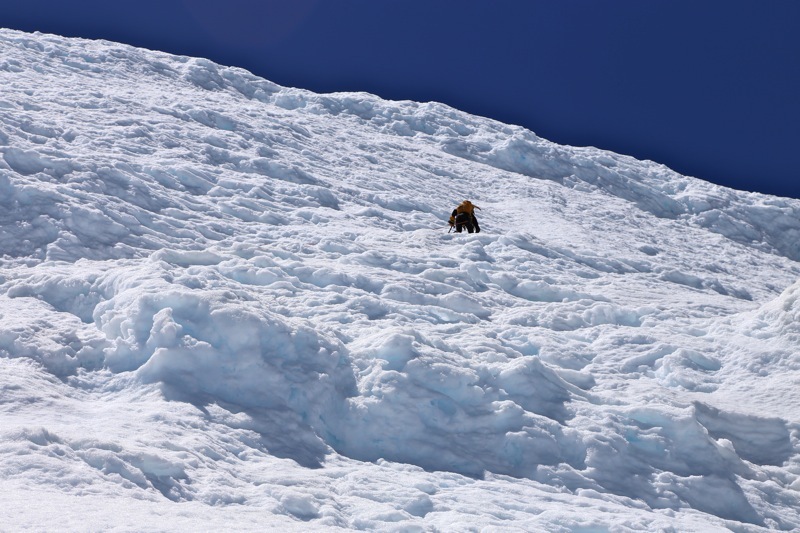 The climb was easy in the beginning, an icy glacier surface giving pretty good crampon conditions. We noticed that the cloud carpet was slowly ascending as well, but keeping respectfully below us. 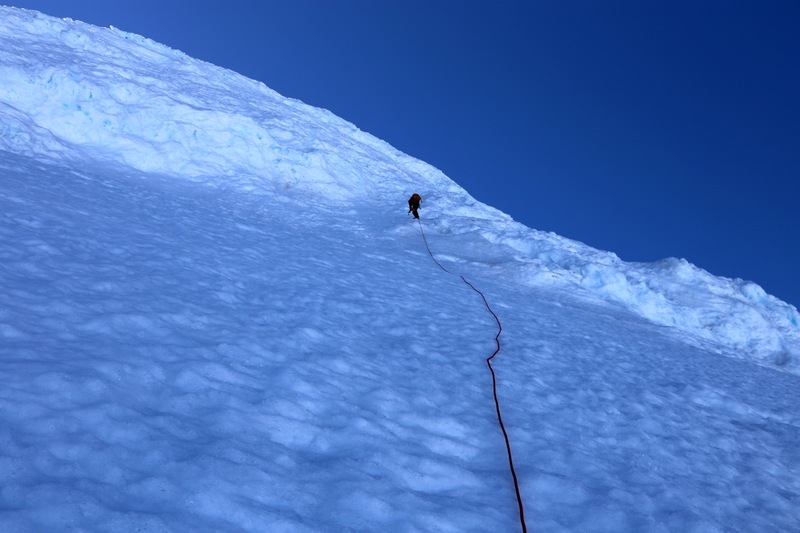 Higher up, more care is needed and we stopped and decided to protect the last 100 meter with our rope. Cutting through icy crystals, I initially tried to place an ice screw. However, even below the top surface, the ice was poor and not suitable for a screw placement. We carried two (deadman) snow anchors and decided that they would have to be used. 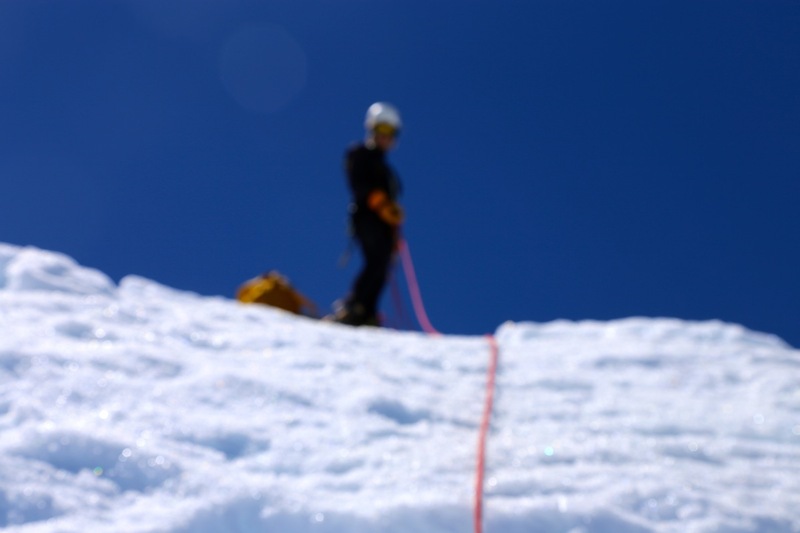 Pål Jørgen quickly advanced up the first rope length placing one anchor along the way. 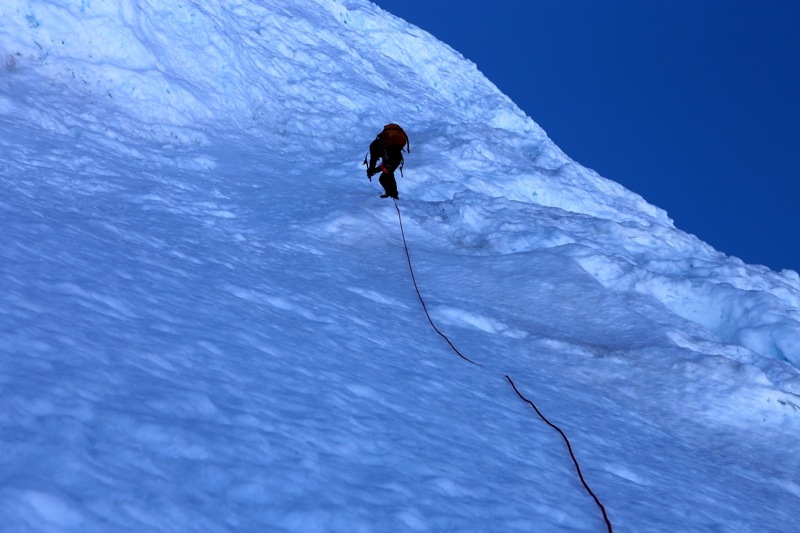 The second pitch was steeper, in fact steeper snow than Pål had ever climbed before. It was nice to see him climb up the final, steep wall and establish himself out of view. 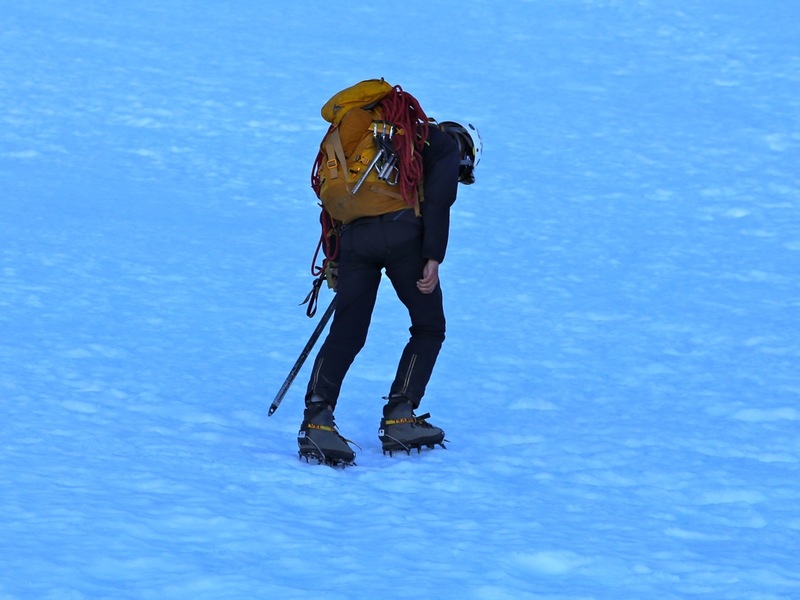 I followed, speaking briefly to the first party where the guide was lowering his two clients down the upper pitch. 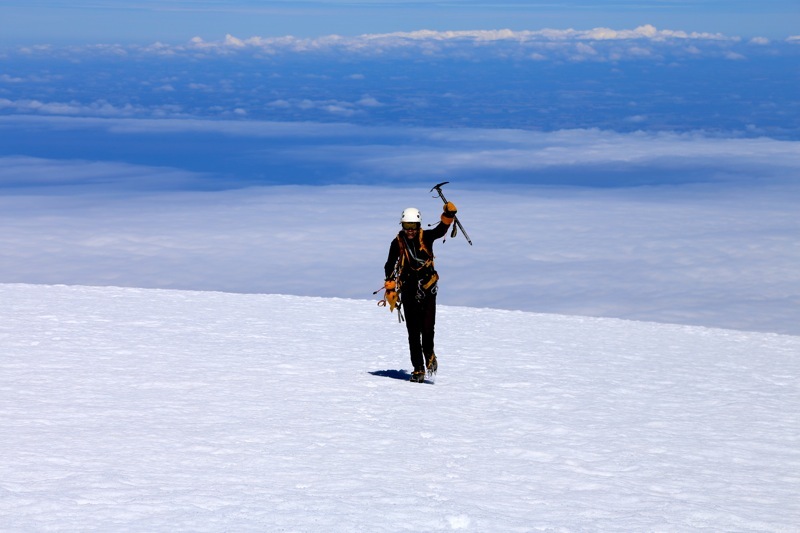 It turned out that he had also spoken to Pål, remarking that we climbed in "traditional style" (meaning only one ice axe). The other guided party that came up behind me, climbed with each climber using two short axes. 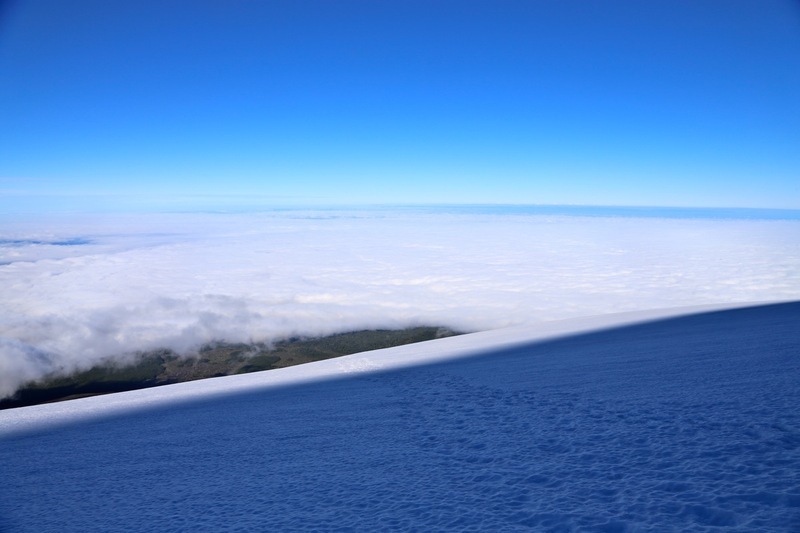 We arrived at the summit at 1145, blue sky all over, with some clouds below - and a very good view in all directions. This is certainly a very nice summit and we enjoyed the views and the place for a full half hour before starting back down. We reversed our route rather carefully, got back down to the moraine and continued down the trail, then road after a short break to rearrange gear. We arrived back at the car by 1525, a total time of 8.5 hours including the time on top. Returning to Puente Varas, a nice dinner was in the cards, then preparation for our last Ultra on this trip, Volcan Calbuco. The weather forecast was not ideal, but we decided to give it a try with a very early start the next mornning. 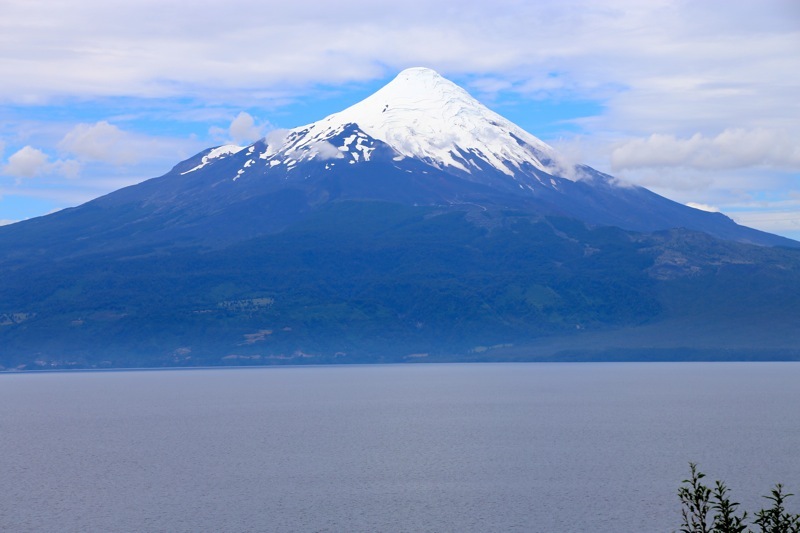 Volcan Osorno, towering above lago Llanquihue. Lago Llanquihue, as seen from the slopes of Osorno. 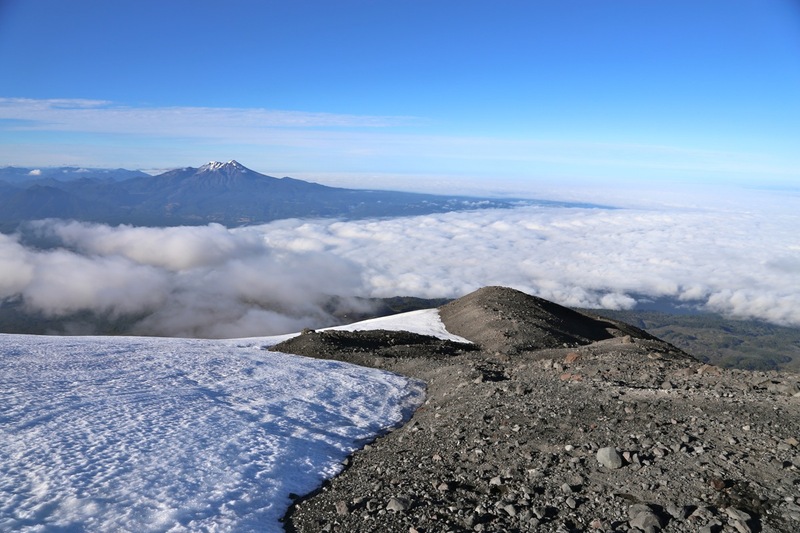 Volcan Osorno, as seen from Ensenada. 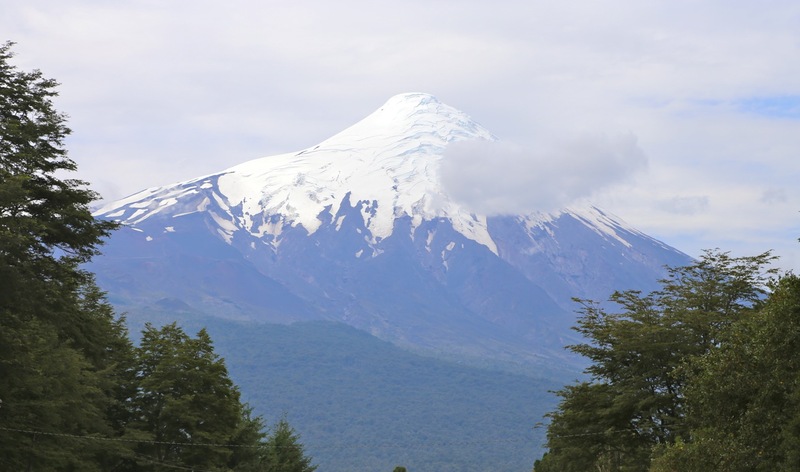 Volcan Calbuco, as seen from the slopes of Osorno. 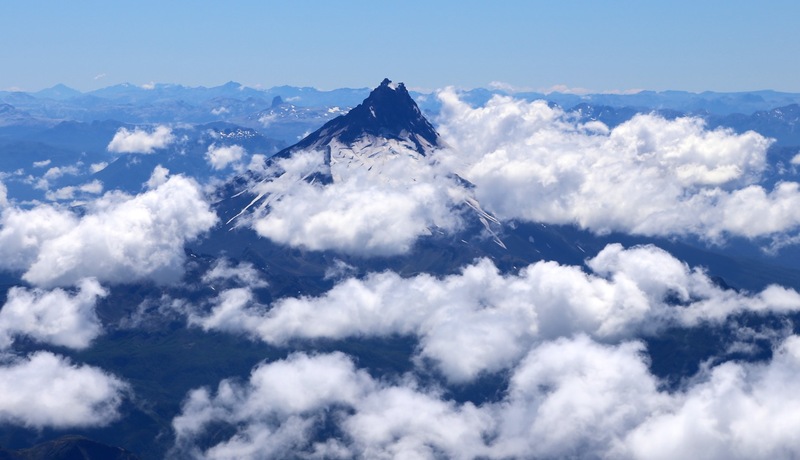 Volcan Tronador, 3491m, as seen from the summit of Osorno. 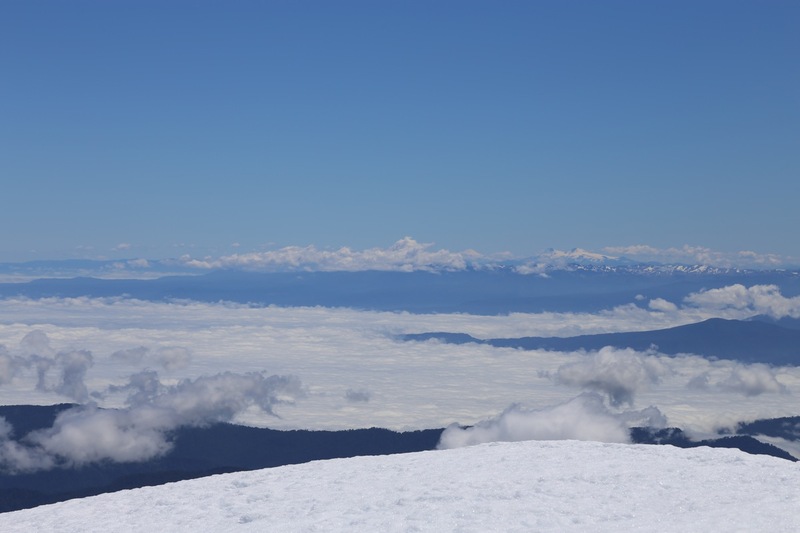 Volcan Puntiagudo, 2493m, as seen from the summit of Osorno. A guided party, descending below us. The route, the German and his guide can be seen in the upper section.